The Gallery designed by Charles Gwathmey at Glenstone. The lately oft-heard term “private museum” sounds exclusionary. Glenstone, however, is anything but. On October 4, the Maryland modern and contemporary showplace unveils a massive addition—making it one of the country’s largest and most significant private museums. Glenstone was established by the billionaire collectors Mitchell and Emily Wei Rales, and the couple has lavished attention on their brainchild. The original Glenstone space, known as the Gallery, opened in 2006 on a bucolic and elaborately landscaped property, now some 230 acres. Admission is free, both to the Gallery designed by Charles Gwathmey and the new Thomas Phifer–designed addition, the Pavilions, which multiplies by more than five times the exhibition space for works from a collection that numbers more than a thousand. Jeff Koons’s flower-bedecked Split-Rocker (2000) at Glenstone. 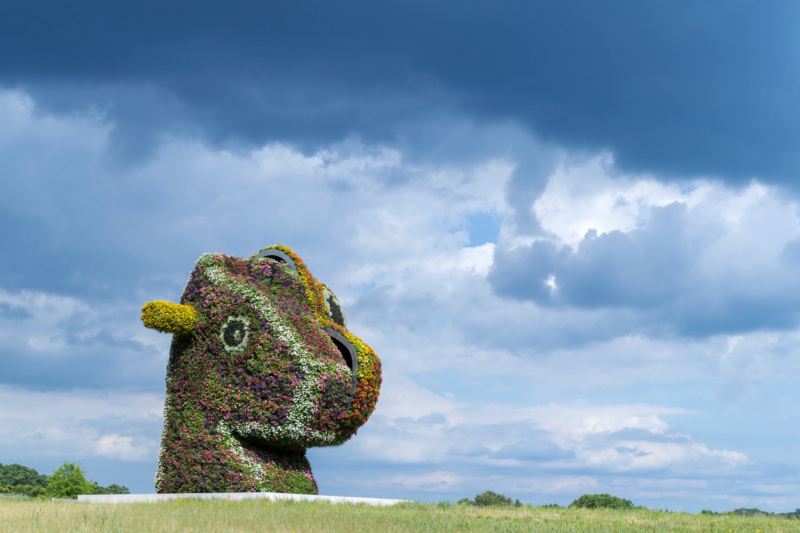 Even on an early visit when it was under construction, the vibe is serene but joyful, epitomized by Jeff Koons’s flower-bedecked Split-Rocker (2000), which commands a view atop a hillock. The Raleses are proud of their trove, but the museum doesn’t exist for self-flattery (they live close by, to keep an eye on it all). Admission is by reservation, so that when you’re there, the experience can really soak in. 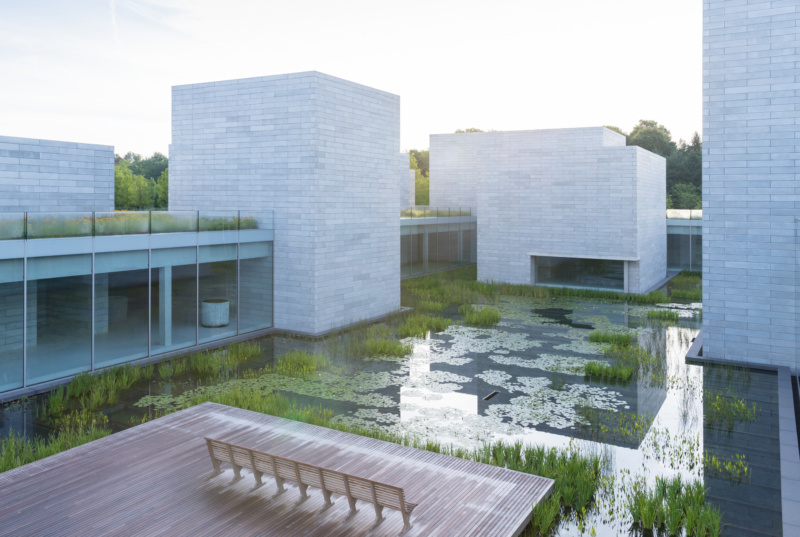 Until now, Glenstone has stayed oddly under the radar—it’s less than an hour away from Washington, D.C., but a lot of local art lovers don’t know about it. Emily Rales, whose title is co-founder and director, jokes that the Gallery was their “starter museum”—true only if your idea of a “starter” is nearly 30 important works by Louise Bourgeois, which are on view this fall in the Gallery. It will soon be hard to ignore, though, given the quality and quantity of art arriving in the Pavilions for October’s opening. The large exhibition space will feature pieces by Jean-Michel Basquiat, Marcel Duchamp, Eva Hesse, Jasper Johns, Donald Judd, Willem de Kooning, Barbara Kruger, Mira Schendel, Clyfford Still, Rosemarie Trockel, Anne Truitt and Andy Warhol—among others. 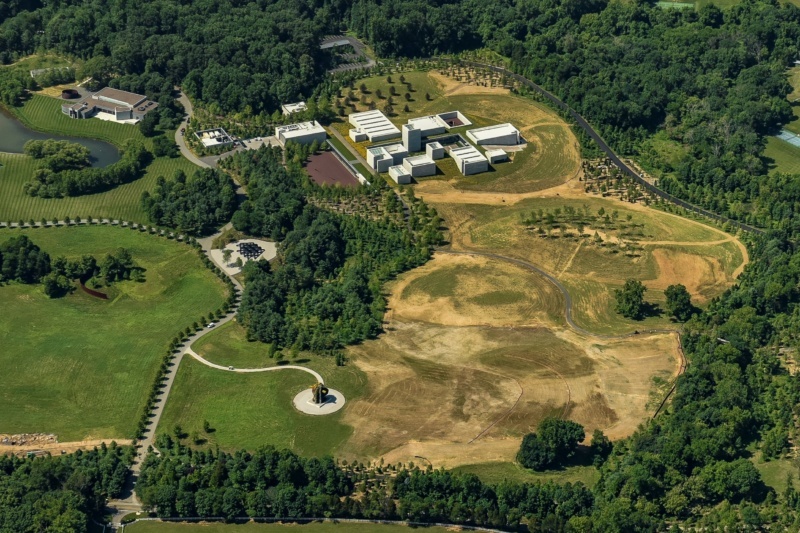 Aerial view of the Glenstone compound. 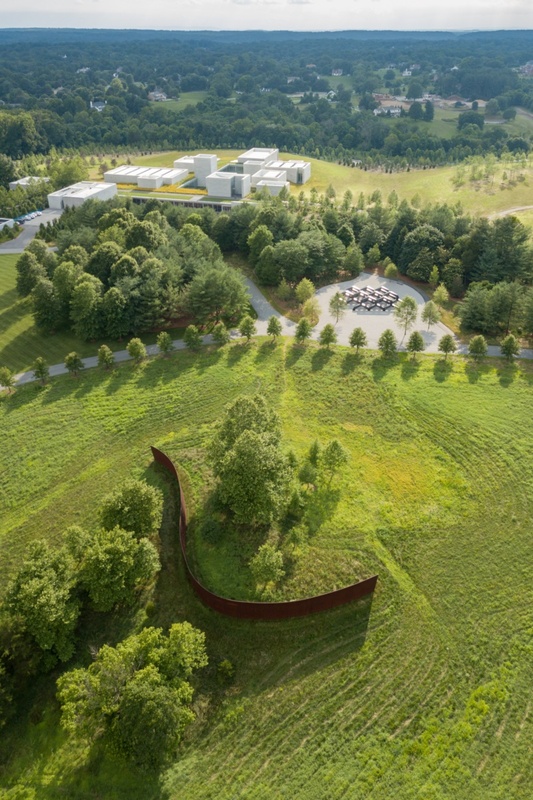 In other areas, Michael Heizer has two enormous and eye-popping pieces on view that immediately make Glenstone a hub for land art on the East Coast. Many of the goodies were under wraps until the last minute, but one of the most noteworthy facets of the Pavilions is its suite of entire galleries, each dedicated to a single artist. Robert Gober has one of these spaces all to himself for the single large piece Untitled (1992). Originally shown at Dia, it is comprised of a suite of sinks with running water, a painted forest on the walls and Gober’s signature stacks of altered newspapers. Emily describes their marriage as a “meeting of the minds.” When she met Mitchell in 2005, he was always already wildly successful in his global science and technology businesses and was finalizing construction on the Gallery segment of Glenstone. She was working at a gallery. The Raleses traveled around the world to private museums in Denmark and Switzerland to nd inspiration for the serene setting. Pictured here is a water court within the Pavilions, the Glenstone Museum’s new Thomas Phifer-designed expansion. This fall’s opening will be the fruit born of those seeds—in literal form, via the lush landscaping by PWP Landscape Architecture that surrounds Phifer’s architectural statement in concrete. From a distance, the Pavilions are meant to resemble a hill town of mysterious, rectangular forms, separate but clustered together; once inside the visitor realizes that they are all connected, surrounding a picturesque sunken pond filled with water lilies. The water view will mesmerize as much as the art, and the well- conceived spaces are likely to win plaudits and awards. Richard Serra’s Contour 290, 2004 and Tony Smith’s Smug, 1978/2005, with Phifer’s Pavilions in the background. To figure out the architectural statement they wanted to make, the Raleses traveled the world to visit key small, personal museums, like Denmark’s Louisiana Museum of Modern Art, the Fondation Beyeler in Basel and Houston’s Menil Collection. They wanted to hire a serious mid- career architect at the height of his abilities, but not a starchitect, and Phifer fit the bill (Gwathmey died not long after the Gallery was completed). “We started to acquire room-size installations like Bob’s piece, and you have to design everything with that in mind,” says Emily. “And so that became the premise: each pavilion is a discrete entry into the world of an artist, but they all belong together.” The entrance to the Gober piece is quite cheeky—it looks like a temporary construction door, with peeling plaster and tape, but is in fact the finished gateway. Emily, having checked out those private museums, has a succinct way of explaining their personal approach: “It’s not the typical blue-chip thing, where it’s just one treasure after another.” In thinking so deeply over a dozen years about not just buying the jewels, but fitting them together in the right setting, Glenstone stands apart.